Michael Keaton, center, with Gugu Mbatha-Raw, left, and Martin Freeman at the BAFTAs at the Royal Opera House in London on Sunday. The Academy Award for best picture will probably go to “Boyhood,” about a young Texan growing up, or “Birdman (Or The Unexpected Virtue of Ignorance),” which tells the story of Michael Keaton struggling to put on a play. We know this thanks to last weekend’s Directors Guild of America Awards and BAFTAs. “Birdman” took the top DGA award, for best director. “Boyhood” took the BAFTA for best film. The DGA has the best prediction rate in the past 25 years: 76 percent of films that won that award for best director went on to win best picture at the Oscars. Last weekend’s plaudits for “Birdman” and “Boyhood” essentially pushed the two films further in front of the pack. 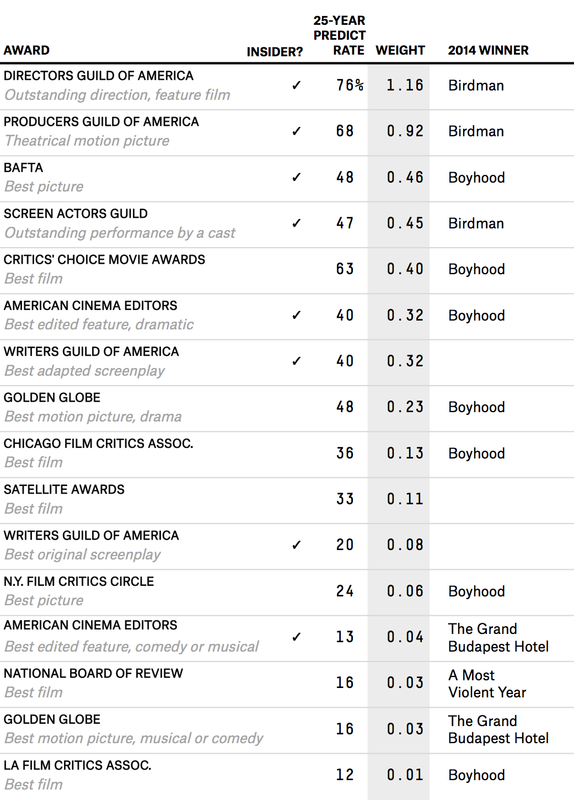 Factoring in those awards, “Birdman” has a score of 3.27, and “Boyhood” has a score of 2.47. And what’s more, there aren’t a lot of potential points left to claim. With just the Writers Guild of America and Satellite awards left, about 0.51 points remain to divvy up. Is it possible for another film to win best picture at the Oscars? Definitely. Sometimes there’s a backlash against the favorites. There are also dedicated campaigns to woo voters, and we don’t have data on how these campaigns influence Academy members. And there’s a history of big upsets at the Oscars. “Crash” in 2005 and “Braveheart” in 1995, for example, won best picture with zero consensus from the other awards. Looking at the scores, there’s an argument to be made that this year is one of the most competitive in recent memory, and I plan to check that out soon. But either way, the stats and the conversation around the early awards point to this being a race that’s probably between only two horses.